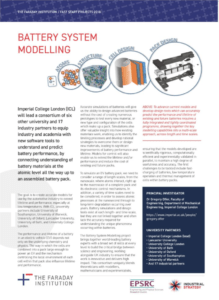 To advance current models and develop design tools which can accurately predict the performance and lifetime of existing and future batteries requires a fully integrated and tightly coordinated programme, drawing together the key modelling capabilities into a multi-scale approach, across length and time scales. The performance and lifetime of a battery in an electric vehicle (EV) depends not only on the underlying chemistry and physics. The way in which the cells are combined into a pack large enough to power an EV and the mechanism controlling the local environment of each cell within that pack also influence lifetime and performance. Accurate simulations of batteries will give us the ability to design advanced batteries without the cost of creating numerous prototypes to test every new material, or new type and configuration of the cells which make up a pack. Simulations also offer valuable insight into how existing materials work, enabling us to identify the limiting processes and develop rational strategies to overcome them or design new materials, leading to significant improvements of battery performance and lifetime. Models for control will also enable us to extend the lifetime and/or performance and reduce the cost of existing and future packs. To simulate an EV battery pack, we need to consider a range of length scales, from the nanoscale, where atoms interact, right up to the macroscale of a complete pack and its electronic control mechanisms. In addition, a variety of time scales need to be considered, in order to assess atomic processes at the nanosecond through to long-term degradation occurring over years. Battery simulations and design tools exist at each length- and time-scale, but they are not linked together and often lack the accuracy required for understanding the unique phenomena occurring within batteries. The Multi-scale Modelling project brings together world-leading battery experts with a broad set of skills at every level to build the critical bridge between science and engineering, working alongside UK industry to ensure that the work is innovative and delivers high impact. This consortium uniquely blends theoreticians with modellers, mathematicians and experimentalists, ensuring that the models developed are scientifically rigorous, computationally efficient and experimentally validated in parallel, to maintain a high degree of usefulness and accuracy. The first challenges to be tackled include fast-charging of batteries, low temperature operation and thermal management of cells within battery packs.